Photo ID card issued by Bar Councils to advocates can be used as a valid identification proof to enter Airport terminals along with valid tickets. The same was clarified by Central Industrial Security Force in response to the feedback given by advocate Mohit Kumar Gupta. 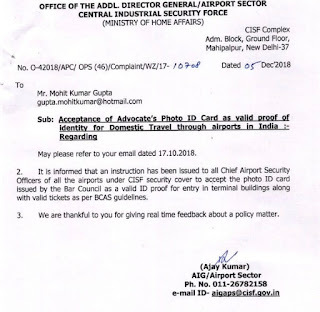 As per the response by CISF, instruction has been issued to all Chief Airport Security Officers of all the airports under CISF security cover to accept photo id card issued by the Bar Council as a valid proof for entry in terminal buildings. Valid tickets should also be furnished along with the id proof. 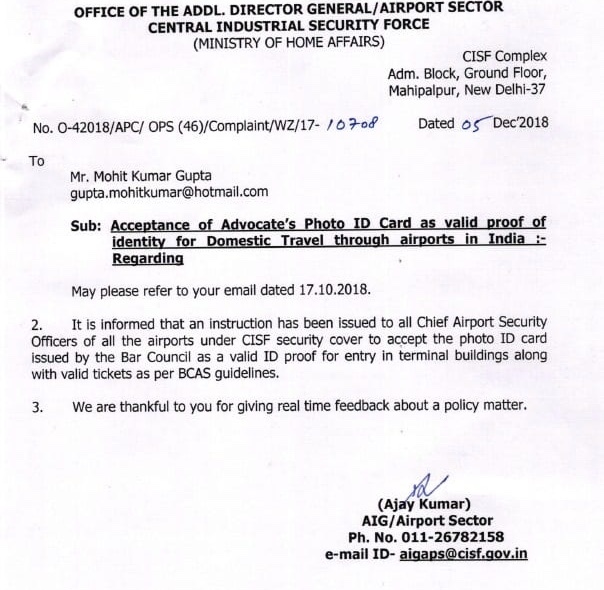 “It is informed that an instruction has been issued to all Chief Airport Security Officers of all the airports under CISF security cover to accept the photo ID card issued by the Bar Council as a valid ID proof for entry in terminal buildings along with valid tickets as per Bureau of Civil Aviation Security (BCAS) guidelines”, the response states.